It’s easy to write the way ‘everyone else’ writes without stopping to see if there’s a simpler way to say something. Having a mental picture of my ideal reader helps my writing: I want to make it as easy as possible for them to understand my message. I do follow most of the things that might make what I write less concise but still I like it that way. Thank you for the reminder about redundancy. I read, re-read, and edit my writing until I’m satisfied all unnecessary words are deleted. Fantastic tips, proving once again the usefulness of this blog! I have to disagree with the example in #4, though – “occurs” seems awkward and too corporate for a “telling passage.” But it’s hard to tell out of context. Great list! However, I agree with Stephanie on #4. Not only is “occurs” a weak verb, the passive voice keeps it weak. Maybe say: “A telling passage near the end of the story binds together all of the threads”…….or something like that. I actually like the “occurs” in #4, personally. “ATM machine” and PIN number” drive me crazy, and we should all be able to agree and concur that people everywhere in all places should stamp out and do away with redundancy! I disagree with both “The report gave an analysis of the accident” and “The report analyzed the accident” because it is not the report that does the anlayzing, it is a person who then records that analysis in a report. Great advice if all you care about is simply reducing your word count. But if you want your prose to have a poetic or lyrical quality, the most concise way of writing isn’t necessarily the best. Gratuitous words intensifiers and qualifiers can help establish the tone in humorous writing, as can euphemisms. Even cliches have their use in this regard. Still, this is a useful guideline, particularly items 1, 4, and 7. Aren’t some of these just reworked versions of Orwell’s rules, which were criticized only a few days ago? Following these guidelines does not discourage poetic or lyrical writing. 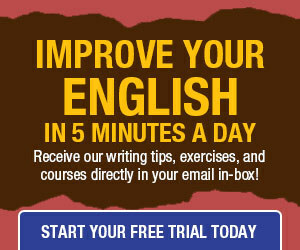 They simply help writers craft vivid, active, robust prose. Nor am I suggesting that every one must be followed in every piece of writing. Of course allowances should be made for humorous writing. I don’t think these guidelines are as severe as Orwell’s. Nor, as I mentioned to Bob, are they strictures to be observed in all cases. I’m merely pointing out specific elements of writing that weaken prose if they are routinely tolerated. As a technical writer, I’m less concerned about poetic or lyrical writing. Tech writers are some of the worst offenders when it comes to adding useless gobbledygook (that’s a technical term)! My practice is to dedicate my first edit to accuracy and consistency, and my second to eradicating cliches, unnecessary modifiers, redundancies, etc. This article provides a great list of the common enemies of clarity. Thanks! I write a seven sentence daily blog (sevensentences.com) where brevity and concision are things to be valued. Limiting yourself to a word or sentence count and constantly practicing is a great way to develop this skill. My biggest problem is qualifiers. For me this lessons the impact of a sentence, like telling a girl she is “kind of” beautiful. Here in lies the power of reading it over the next day. The mood you are in when you begin writing is also important. For me deadlines and constraints enhance the directness of my prose and actually help. Knowing what works for you is the key. Conciseness is always the way to go no matter what you’re writing. With academic papers, it’s always been very easy for me to be concise, but in my fiction, I tend to ramble. Not as much in the prose, but the dialogue. I think every one of my characters constantly breaks all of those tips when speaking because that’s how people speak. It’s not eloquent and it’s not rehearsed. But even then, there’s always room to tighten up the language in both the prose and the dialogue in the revision process. These are good reminders towards writing that will compel the reader to turn the page. Tricky business, this simplification. If getting the nuances and implications just right is important, then removing linguistic machinery can actually add room for misinterpretation. as soon as we get to “considered”, we know that the next part of the sentence will be about the street, in some way. at this point we don’t yet know whether “considered” is a participle referring to Lombard Street or an active verb referring to “We”: the sentence could legitimately continue “… whether to risk the one-way system, then gave up and headed off to Nigel’s house”. 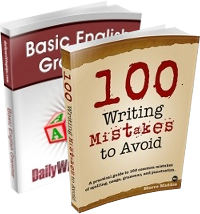 Leaving wrong pathways open to the reader is likely to make them start off down one of them at some point, which will make them stop and backtrack when they realize they have erred – which does not make for an effective text, especially if the writer’s aim is to persuade or sell. It’s a tricky old business is this language lark. The part about the ‘The report analyzes the accident’. The “report” is the result, so in my opinion, it should be written as follows: The accident analysis is in the report. HIV virus makes me crazy. What do people think the V in HIV is? Off the subject, but just curious: Do you think that in our lifetimes we will ever hear the likes of “You guys” done away with? Drives me crazy, as even in some high-end restaurants, we hear servers ask, “What would you guys like to have to drink?” Argghhh! Florence, I don’t think we’ll be eradicating “you guys” anytime soon. English lacks a second-person plural pronoun, so people will try to make due with constructions such as “you guys”, “you people”, “you all” or even “y’all”. Unless we manage to resurrect “thou” as a singular pronoun, these annoying attempts at a plural will remain for disambiguation.